There’s a popular critique in many startup blogs downplaying the importance of raising capital. The argument is that raising capital is easy and the real work happens after a company raises money. Rather than celebrating companies that are generating revenue and turning a profit, startup culture chooses to celebrate companies that are raising lots of venture capital and by doing so we end up lionizing the wrong startups. Having bootstrapped two startups and seen one of them fail in part because of an inability to raise capital, I can say straight up, I think this popular critique is a bunch of poop. Raising capital IS important and it should be celebrated. As a startup founder, your most important responsibility is getting key stakeholders to believe in your vision of the future. This means everything from finding a co-founder and early employees to convincing that first customer to believe in your product. Getting the right investors to buy into your vision is a huge part of your role, and it’s an important milestone in the lifespan of a startup. For Most Startups, Capital is a Necessary but not Sufficient Factor for Success. Of course raising capital doesn’t mean that your startup is going to be successful. And of course not every startup is the type of startups that should be taking on VC funding. But for the startups that actually do need the money in order to achieve scale (i.e. startups that hope to become $500 million+ companies) taking on an appropriate amount of funding from the right investors means your startup at least has a chance for success. Last week GiveForward announced we had just completed a $2mm raise with some great investors. 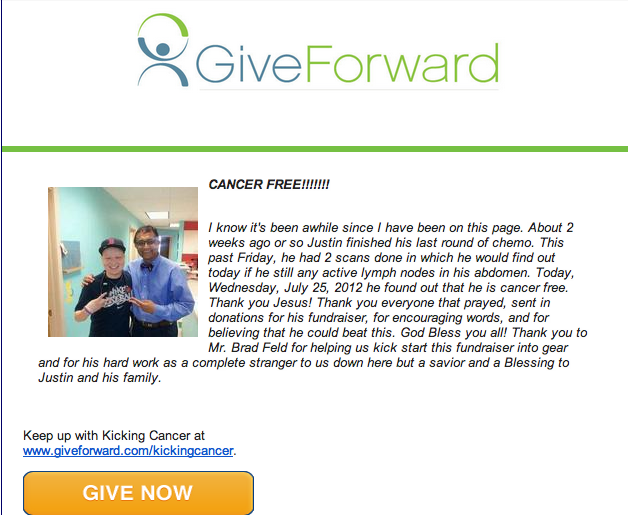 On the same day we announced our raise, we got an email at the office from one of our users on GiveForward who was fundraising for a 17-year-old named Justin battling stage 4 testicular cancer. The email subject line read: CANCER FREE!!!!!!!!!! As a company, I can tell you there was 10 times more excitement around the office when we got this email than when we saw our names in TechCrunch. These are the kind of emails that we live for! But, had we not raised capital last year, we would never have received this email. We never would have been able to grow a team and advertise our services, and Justin’s family likely never would have found us. So, at the end of the day is raising capital something worth celebrating? Yes!!!! If raising capital means we are now going to be able to reach thousands more families just like Justin’s, then I believe it is absolutely something worthy of celebration. Great article, I’m teary eyed! I am at a start-up going to through the same fundraising process and we see emails from educators around the world who love using our product in the classroom. It really makes our day when we hear such positive feedback from users but I can only imagine what that email must have meant to your team. Great news for Justin and GiveForward! Keep the posts coming- always nice to get the inside look at such a cool company.